I once saw a pattern for a knit panel to button onto a peacoat to keep mom and baby warm as baby rides in a sling or front pack. I seem to remember it being on Knitty or Magknits, but haven't had any luck finding it. Part of the problem is that my search terms are less than ideal (knit peacoat baby closer thingy?) and knitting pattern names don't always describe the item itself (why is a knit beret called Gretel?). Does anyone know what I'm talking about? If you can help me identify the pattern, I'd be eternally grateful. I've written before about my tendency to misplace things. This weekend my losing streak veered into knitting territory, once again in record time. I finished Tiny Sushi's wonderful Chevron Mitt pattern on Saturday, weaving in the ends from the Q train on my way to Cassie's. My fellow knitters oohed and ahhhed accordingly over the chevron cable pattern running up the back of the hands. They are were really lovely. Yes, I'm afraid you'll have to take my word (and theirs) that these mittens ever existed. By Sunday afternoon they were gone. The leftover yarn bits are all I have as proof of their origin. As far as I can tell, they went MIA somewhere between Park Slope and Union Square. If you happen to see them roaming the streets of NY, please let me know. At the very least, I hope they're on the hands of someone who appreciates them. 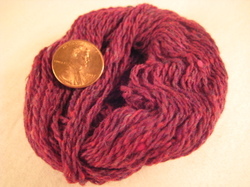 After a brief period of mourning, I picked myself up this morning and got yarn to make a second, identical pair. I don't do repeat knits very often, but this is a special exception, and the pattern is really fun to knit. A little part of me is still hoping that they'll turn up, so I'll be casting on for some gift knitting Stulpen mitts to tide me over. My pattern details, minus any finished photos, are up on Ravelry. My last paper is due tomorrow. I made it into bed last night at 1:42 AM, tired, but pleased with the amount of work I had completed. As I pulled back the covers and got into bed, my upstairs neighbors started running the vacuum. At 1:42 AM. The vacuum cleaner stopped. Then the Christmas Carols began. Their song of choice? Do You Hear What I Hear - the Vanessa Williams version. The irony of their musical selection was hard to bear, but I was too cold to get out of bed to complain. You're damn right I hear what you hear. Bah humbug. Hmmm, I don't take statistics until next year, but it seems like there is a direct relationship between the amount of work I have for school and the number of projects I add to my Ravelry queue. As it stands, I have two major papers due tomorrow and have increased the number of items in my queue by 50% in the last week. Coincidence? I think not. I've never said that I'm not easily distracted. I am very ready for these papers to be over and done with. One paper analyzes affordable housing policy and the demolition of dilapidated housing projects, the other designs a client intervention for survivors of torture. The combination of subject matter and heavy workload is not making for the most uplifting weekend. Right now, I'd much rather be knitting. Kiri - will use up stash yarn and introduce my brain to a project beyond the aforementioned garter and seed stitch routine. Veronik Avery's Layered Skater's Top will finish off the rest of the orange kidsilk haze that has been languishing in my stash. As a former competitive figure skater, I had assumed that the "skater" referenced by the pattern was of the icy variety. I checked out the book from the library this weekend and realized that this pattern refers to skaters of the Vision and Vans boarding legacy. I'm no Tony Hawk, but this is still a top for me. Sorry for the pictureless post, the two way split B and I balance between residency in MSP and NYC have us sharing a camera. Pictures will have to wait until I regain custody next weekend. December 1st brought more than a Midwest snowstorm. It also brought a baby! My sister delivered a yet-to-be-named baby girl at about 2:00 PM CST. I'll be braving the snow to head up to Duluth and back tomorrow to see her. Unfortunately, three paper deadlines loom on the horizon next week and will prevent me from staying any more than the day. 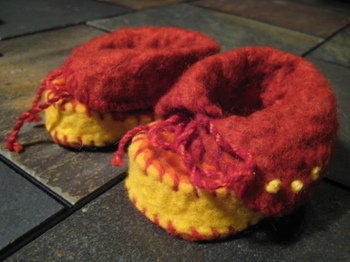 Pending pictures and naming of new baby, I'll leave you with some Wooly Girl moccasins from North Dakota that I picked up for her at the MN Textile Center's Holiday Sale.